Why is it necessary to tell Christians to get Serious About Prayer? · One study has shown that the average professing Christian, spends less than 2 minutes a day in prayer. Another study reported that 28% of church leaders spent less than 10 minutes a day in prayer. This percentage significantly increases when Pentecostal/Charismatic leaders are excluded. The proper place to began anything in the Church is In Prayer, and Prayer Ministries are no exception. · Pray often, pray regularly, and pray with others who understand the need for prayer. · No ministry within a congregation is likely to survive without the genuine endorsement of the Pastor, and a prayer ministry is no exception. · If you don’t have the buy-in of the Pastor(s), pray about it, and get others to pray also. · Regardless of the official roles of lay members in a congregation, there are always those members of the laity whose opinions carry more weight than most. The greater the number from this group that will buy-in to the ideas, the quicker the prayer environment will be changed. Pray about this, and get others to do so also. · Even if a congregation is large enough to add a Prayer Director to their full time staff, the prayer ministry is likely to be led by someone who is not an ordained minister. The selection of a leader is very important and can be a critical turning point even before the ministry has began. The person must have the gift of leadership. They should have the gift of intercession. Seek this person in prayer. For all the reasons to start a prayer ministry, and for all the reasons we wish to pray more and better, and wish others to also pray, Satan will oppose us. You can rest assured that if you are making progress, he will increase his attempts to distract you. It is crucial that you pray for protection. That you pray for your family, and those close to you. That you pray for others who are involved in building a prayer ministry. Prayer will cause Satan concern, and prayer is our best defense. · Don’t underestimate this point. · Church work is no threat to Satan, but the work of the Church is deadly to his goals and plans. Through Prayer we will advance the work of the Church. Satan cannot stop prayer, so he will attempt to stop the pray-er. · Leave room for God’s hand in all that you do, but don’t sit around doing nothing. If you have done the things above, you will already have assembled a group of like minded Christians. 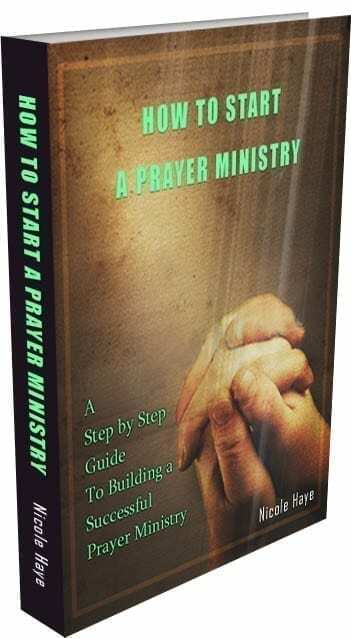 If you meet regularly to pray for your congregation, its needs, and the needs of it members, then you have already, successfully, implemented a very important prayer ministry. · A Sunday School class for Adults as well as one for children. · Prayer must be taught from the pulpit to reach a segment who will attend only Sunday Worship Services. · People will be overwhelmed by too many changes and it will stress your resources as well. It is much better to begin one or two new things at a time, and allow them to become established before adding another activity. · One person cannot effectively run a multifaceted ministry. The leader should recruit, encourage, mentor, and DELEGATE. You will build more leaders by having a different person in charge of each activity, and you are not as likely to burn anyone out. By giving a person ownership of an activity, they will generally do a better job. A good leader must know how to say no to additional work before it becomes too much. · Not everything is right for everyone, in fact do not expect your prayer ministry’s inner-circle to participate in every activity. Do not expect your leader to personally take part in every activity. Each person, led by the Lord, must do what is right for them. Do not be surprised by who does or doesn’t participate, but rejoice and thank the Lord for those he leads to participate. · One of the aspects of getting serious about prayer, is for your group to become obsolete. A goal should be for prayer to become so pervasive in the activities of the Congregation and of its members, that there is no need for a separate advocate. People aren’t going to get excited about something they don’t know about. Use available avenues to tell the Staff, Lay leaders, and congregation as a whole of what the Lord is doing within your midst. It’s much more fun when you can share it with others. Respond when someone from the congregation tries to use a given activity in a way that you didn’t anticipate. · A request applying to a prayer activity is a good indicator that you are succeeding with that person, if you can accommodate that person you should do so. The Lord can use our work to produce fruits that we have no understanding of, and never anticipated. · Much has been written about the shift in the population. One trait consistently brought to the front, is that people are less willing to commit for long periods. There are a growing number of people who will not make long term commitments to anything. Keep this in mind as you implement activities. Keep a mix of things that allow a short term commitment or even no commitment in addition to those things that require a longer term. There are people who will make ONE commitment for ONE WEEK 52 times in a row, but they would not consider making a commitment for a year to the same activity. · Not all are at the same point of Spiritual maturity, and not all will grow at the same rate, or even with the same stimulus. This may be a obvious point, it is very easy for us to forget. In forgetting we open ourselves to the pitfall of narrowing the scope of our ministry, in falling prey to Pride, and self-righteousness. This can create opposition to our ministry and contention in our congregation. Base your ministry on Love, on our Savior and on Prayer to the Glory of God, our Father, to Jesus our Savior, and our Comforter and Guide. This can be said for any activity we find ourselves in, and is certainly true in building a Prayer Ministry. · This is the inner circle or steering committee. · This group will initially meet weekly for about a year, and then began to meet semi-monthly. · This will be a small group of people who were interested in stronger prayer within the congregation. It will quickly fall to fewer members. · The first 6 meetings should be centered around a prayer class, with prayer resources such as video and workbooks. · At every meeting time should be reserved for small group prayer. · The members from this group become leaders of the various activities. A person takes responsibility for the task, and recruits help from the group and from the congregation. No one should be pressured to take a leadership position. Leave the work to the Holy Spirit to convict each person of the position they should take. · A Covenant should be established with guidelines on how the ministry will work and the conduct of it’s members. There can be several different covenants depending on the role of each person. · Children are brought to the front of the sanctuary for an object lesson during non-communion worship services. After the object lesson, before returning the children to their seats. The pastor leads the group in a prayer related to the subject just covered. The pastor verbally gives the prayer to the children in short phrases, and the children then repeat the prayer. · Each month the church board/elders/leaders are asked for their prayer needs. These needs are distributed to all of the board chairmen and asked to pray for the other boards. · These prayer needs are circulated to selected individuals in the congregation as well as the Prayer Support Group. Pray for wisdom of the circulation list. Prayers of thanksgiving should be solicited in response to the answers to previous months’ prayer needs. This activity will serve several purposes, it brings God’s power and wisdom to the activities of the congregation. It keeps the lay leadership aware of the prayer ministry, and of the importance of prayer. It allows you to remind the leadership of the results of prayer. It encourages the leadership to pray for their activities, and for the activities of others. · An early activity is to insure that all members are lifted to the Lord in prayer on a regular basis. This activity has a group of people who agree to pray for one person each day, and send that person a note telling them that they have been in their prayers. There are enough people that every person (adult and children) in the congregation is prayed for, as an individual, two times during the month. · This activity brings immediate benefits and blessings to those for whom prayers are offered, it brings greater joy and blessing to those who offer the prayers, and it serves to bring the congregation closer together. · A weekly bulletin insert is created as a separate page folded to create a four page bulletin. · The Inside section is the weekly prayer requests submitted by the congregation through prayer cards. · The Front special prayer needs for missionaries, and for the local congregation. · This program is designed to encourage the congregation in intercessory prayer. An 8 x 11 sheet is prepared with the prayer need of one person. Other individuals are included on additional sheets. · At the end of Sunday Services, the sheets are passed out by the ushers to whomever wishes to take one. The person who takes a sheet is agreeing to pray for that person during the week, and to fold the sheet into quarters making a small greeting card. The card is sent with a note of encouragement to the person. · Weekend Day or Month long classes in a workshop format with prayer resources and tools. Created and taught by the Pastor, church staff and other congregation members. · New Members class is extended into a 3 week class on prayer followed by 3 week bible study. · This is a traditional calling tree of people who have agreed to receive intercessory prayer needs. · Prayer Line Phone number can be published in the Phone book and Yellow Page ad. · Non-member prayer line calls should have follow-up as a care ministry and as evangelistic outreach. · Email prayer chain can be used to extend the reach and make the prayer line more effective. · The prayer line must not degenerate into a gossip line. · Most churches with prayer lines don’t utilize them to their full potential. Most people will say they believe in Jesus and that He is the Son of God. Many false doctrines and religions say this too. Remember that even the devil knows that Jesus existed and who He is. There are questions that you can ask to know if they are in fact a Christian. Be able to discern whether or not a person is ready to make a commitment to Jesus Christ. Whether or not the person is ready to make the commitment to Jesus Christ, the prayer counselor should never let the opportunity pass to share the Gospel. This may be the first and the last time they hear it. It’s not enough to lead someone to Christ and then leave them to figure out what to do next. The prayer ministry should have procedures in place on where and how the new Christian will be discipled.